Whoa now! The times, they have a-changed, and isn’t that a great thing? Thus this once-socially-acceptable novel, a spy thriller steeped in the Cold War politics of the mid-20th century, no longer works. But thank you for the invitation to review, friends at Net Galley and Open Road Integrated Media; I know you meant well. The author presents a situation in which escaped Nazis are developing plans to foment a second fascist government, developed abroad till the time is right. The ones we visit are sequestered in Egypt. At the same time, Israel’s equivalent of the CIA is out hunting for escaped Nazis, who will die quietly and unofficially so as to avoid international incidents. The writer knows his craft well, and shows considerable skill in building suspense by jumping us from one group to the other at critical, cliff-hanging moments. Had this been the perspective of a deranged psychopath, a mindset clearly different from that of the good guys, I would have been more generous with my rating and review, but this guy is supposed to be the marshmallow among his set, the old softy who gets himself into trouble by trying to save the suffering damsels. For this novel: no, no, and one more time: no! 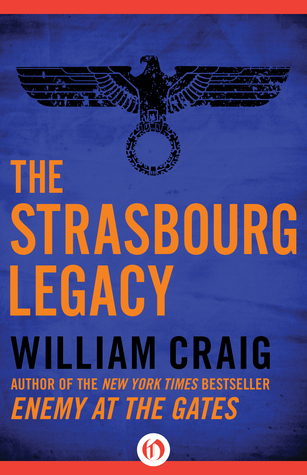 This entry was posted in Cold War and Misogyny and tagged book blog, book blogger, book review, misogyny, The Strasbourg Legacy review by seattlebookmama. Bookmark the permalink.